Xiao-Jia Chen and colleagues from the Geophysical Laboratory, in collaboration with scientists from the Chinese University of Hong Kong and South China University of Technology, have predicted from first principles the superconducting properties of the hydrogen-rich molecular compound silane (SiH4). A gas at ambient conditions, solid silane adopts a structure with the SiH4 molecules oriented so as to produce layers of hydrogen and silicon atoms. This newly-discovered superconducting phase, which forms at 60GPa, has a structure belonging to the orthorhombic space group Cmca. 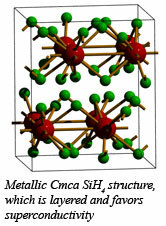 With this layered structure, compressed SiH4 at this pressure resembles a silicon-hydrogen alloy, and provides some insight into the long-predicted existence of metallization and superconductivity in dense hydrogen, a problem that has been an important driving force in the development of condensed matter physics and astrophysics for nearly a century. 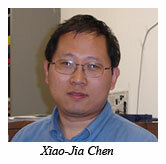 The research, published in Physical Review Letters [X. J. Chen, et al., Phys. Rev. Lett., 101, 077002 (2008)], suggests that the layered motif observed in the Cmca phase could be essential for superconductivity in other hydrogen-rich compounds. This theoretical study confirms the experimental finding of pressure-induced metallization in SiH4, which was reported the team in January 2008 [X. J. Chen, et al., Proc. Nat. Acad. Sci., 105, 20-23 (2008)]. At 60 GPa, silane has a superconducting transition temperature between 20 and 75 K in the layered metallic phase, demonstrating the potential to observe metallization and superconductivity in hydrogen within a potential silicon-hydrogen alloy at higher pressures, but still much lower than would be necessary for solid hydrogen, due to chemical precompression by the silicon. After submission of this work, evidence for superconductivity in metallic silane was reported in the March issue of Science by an international team led by M. I. Eremets, formerly of the Geophysical Laboratory [Eremets et al., Science, 319, 1506-1509 (2008)].